Well, first, I would be willing to bet anything that indoor farms have insects in them. But never mind that. It seems to me that in the long run this is a risky move. Sure, one could make a more and more sterile and clean world for all of our crops just like we have been making for people. And the crops may grow faster, bigger and more easily. But the crops will also not get access to potentially positive things that come from exposure to the world. 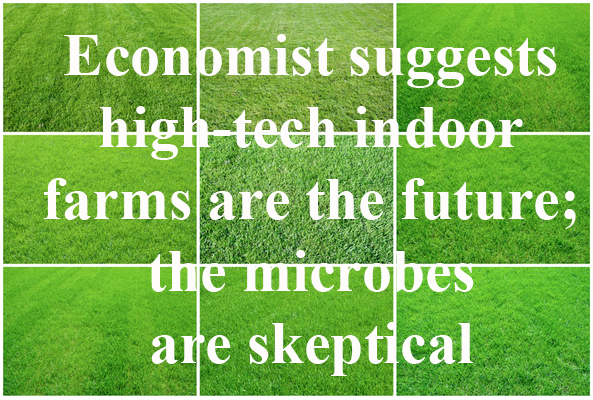 I wonder, for example, what exactly is going on in terms of the microbes in these indoor farms. Are they going to end up like our hospitals – “cleaner” but with a higher percentage of nasty things than the outdoor world? Or perhaps they will end up with microbial monocultures – missing the within species diversity that may be at some times beneficial. 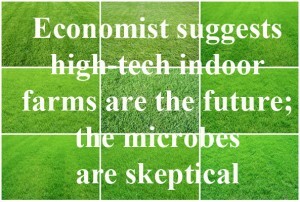 I am sure the microbial ecology in such indoor farms will be altered compared to outdoor farms. Not sure if this will be deterimental in any way, but if I had to guess, I would guess it will not be good to ignore the microbes.
.@phylogenomics @microBEnet The physicists are skeptical too. Indoor farming requires HUGE electricity inputs. @phylogenomics @microBEnet We already have “indoor” farms. They’re called greenhouses. @phylogenomics @microBEnet @michaelpollan Aquaponics is all about the microbes!